New Jersey Chapter of PAR FORE at Kean University to Launch Occupation-based Mentorship Program for At-Risk Youth in Newark. UNION, N.J. – Kean University’s Department of Occupational Therapy (OT) is proud to announce the launch of the New Jersey chapter of PAR FORE, an integrated occupation-based mentor program for at-risk youth. PAR FORE/New Jersey, in collaboration with The First Tee of Metropolitan New York, was developed to address the issues of gang recruitment and involvement. PAR FORE uses the game of golf to teach youth the necessary skills to successfully fill their roles as student, friend, family member and community member. In its first year, PAR FORE will target youth, ages 11 through 17, from Newark, N.J. PAR FORE will begin in June with a six-week summer camp at Weequahic Park Golf Course, located at Elizabeth and Grumman Avenue in Newark, and will continue throughout the academic year with an after-school program. The program will provide a safe haven and opportunity for youth to build their self-esteem, resiliency and coping skills, and engage in healthy activity. 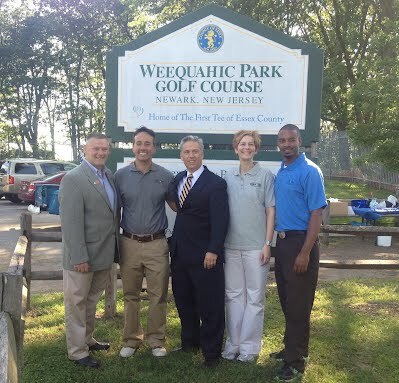 In addition to professional golf instruction, the youth will participate in various activities within the community and at Kean University. Each youth will also be paired with a Kean University student mentor. PAR FORE (Perseverance, Accountability, Resiliency, Fellowship, Opportunity, Respect and Empowerment) is a non profit 501 (c) (3) organization dedicated to serving at-risk youth. The occupation-based mentorship program helps to foster positive personal, social and physical growth and development through the game of golf and community activities. The program aims to prevent gang membership and promotes healthy engagement in occupation at the personal and community level. Currently, there are three chapters of PAR FORE- New York, Utah and New Jersey. Kean alumnus Alex Lopez, executive director of PAR FORE, grew up in Newark, and has been very supportive in the New Jersey chapter’s development. For more information about Kean PAR FORE initiative, please contact Dr. Jennifer Gardner, Assistant Professor of Kean’s OT department, at jengardn@kean.edu or (908) 737-5852. For more information regarding the PAR FORE program, please contact Dr. Jennifer Gardner, Kean University PAR FORE chapter program director at (908) 737-5852 or jengardn@kean.edu. For more information regarding the PAR FORE Mentor program, please contact Dr. Mary Falzarano, Mentor program coordinator at (908) 737-5854 or mafalzar@kean.edu.